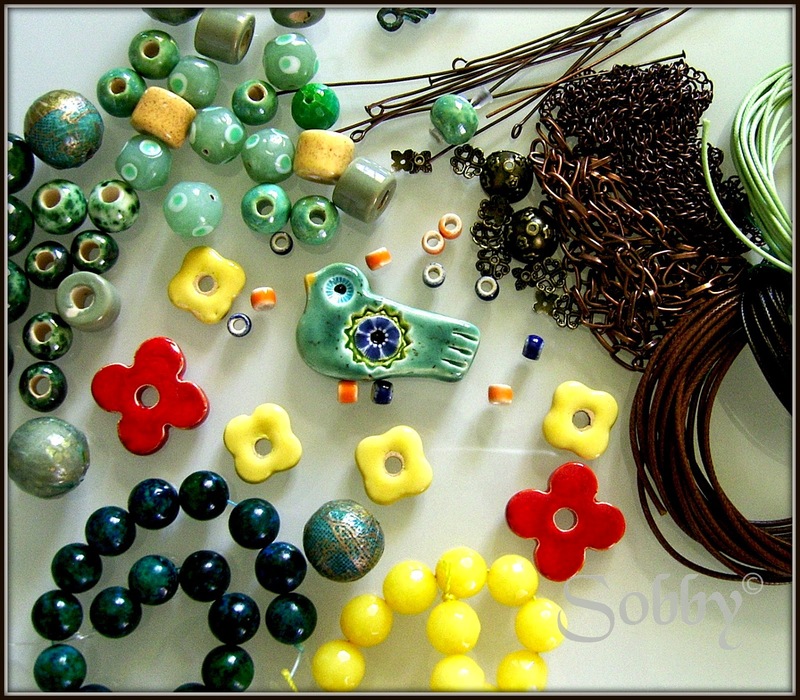 Welcome everybody to the 8th Bead SoupBlog Party Reveal!!! An amazing event created by Lori Anderson with about 500 partecipants every year! Let me start by saying how life is a never ending learning experience, and the Bead Soup Blog Party is one of the most exciting occasions to learn: not only you meet a new fellow beader, but you get to know new materials, new countries, costumes and tastes - yeah tastes, because there’s often a lot of chocolate involved! Last year I was blessed with an incredible partner, Dorota, who spoiled me rotten with a huge amount of goodies. To honor her generosity I decided that this should also become a way of learning new techniques, so I tried myself at bead embroidery, a bit of chain maille, knotting and new shapes in general. I was very proud of the result, which you can see here. It was a celebration of spring and happiness and colors while I was actually spending a lot of time at home, looking for a job. This year my situation is completely different, as I moved to Austria 3 months ago and I am going to school (again) to learn the language, I am proving myself at living in a foreign country with a really different mentality – and did I mention German is not exactly the easiest language…but I am loving every second of it. And again I was lucky to be paired up with a really interesting woman, Rosantia, who chose the most beautiful variety of beads and materials for me. If you would like to know her better, jump to my post about her and visit her blog, because I am sure she will have prepared something amazing for the reveal! I MUST APOLOGIZE AS I AM STILL BEADING FOR THE SOUP, SO I WILL PUBLISH FURTHER WORKS DURING THE WEEK. What can I say, my Muse likes the last minute inspiration! I used the focal and the toggle clasp from the soup, with the matching ceramic beads, and added some beadweaved elements – I just love this shade of light aqua turquoise with orange and blue. I felt so alike to the little birdie, I guessed he was looking for a place to call home just like me. Something about this pendant I won last year looked like the perfect match. Wood, gold and aqua green. I had a lot of fun playing with the 12 mm beads Rosantia sent me. They are the perfect size for a variety of designs that can really make a difference out of a simple stringed necklace. So again, I played with both beadweaved elements and simple beads. I love this green chrysocolla, a gorgeous, rich color. Patterns here are from Kerrie Slade (flower pendant) and Eveline (3er Kringel). For these yellow quartz beads I used Carol Ohl’s tutorial Earthly Hues and just continued with other beads in my stash. Did I ever mention how much I love grellow??? :D I guess I did. More washi paper beads, a czech button from my previous partner Dorota, some beaded beads and gorgeous ceramic beads. Still have to figure it out! Take a look at what my partner Rosantia created, here you'll find her blog which is so full of inspirational handmade creations! So many eye candy goodies are waiting for you on all these blogs, please take the time to jump over and scroll over and you won't be disappointed! Dankeschön Michi!!! Ich freue mich sehr dass meine kleinen Babys geffalen dir! Beautiful jewellery! The second necklace is my favourite. I like the way you combined detailed seed bead weaving with rough leather and large beads. You are so versatile in your designs! The bird one is so full of energy and meaning, the soft green is elegant etc... Fabulous work:D Was it difficult to learn seed beading? It looks very complex. Thanks Annica! I learnt the basics as a kid, but I never stop learning something new, I would say it requires some patience...and good eyes! ooo fab designs! I like the wood gold and aqua combination, love that focal. Looking forward to seeing the finished piece you are working on too. Thank you, I also stopped by to see what you created and was delighted! Your bead weaving is amazing! Outstanding I love the washi paper beads. Good stuff happening here!! You inspire me. Thanks, I was definitely spoiled by my partner! Dear Silvia, if I were close I would come running and give you a million hugs. You have done wonders with my soup and my eyes are watering right now! The birdie piece is beautiful beyond words and you have found the most unusual way to use those tiny ceramic spacers (I might just borrow this idea) and the different connections to the chain - you will see something like that in one of my designs . What about a simple statement necklace? You did it with the second piece. The bail is also bead woven, right? I have to learn that. Love, love the chrysocolla necklace and the colors you have chosen - the small flower and "I bead" charms are adorable! The yellow quartz necklace is very intricate and "technological", it's one of the most unusual pieces I have seen. And, well, I, too, have beads left to work with, which will only prolong the pleasure. I am so greatful to have had you as my partner. You're very brave and talented, you will make it! Those are so beautiful! I love the second necklace with the wood pendant. The yellow piece is glorious, too - very cyberpunk! All are so very lovely ! Looks like your muse certainly inspired you, each piece is incredible, and each is so different from the others. At first I thought my favorite was the necklace with the light green and brown beads and the pretty, scalloped wood pendant, but then I thought, "No, maybe it's the one with the gorgeous yellow quartz beads" but then I realized that they are ALL my favorite. 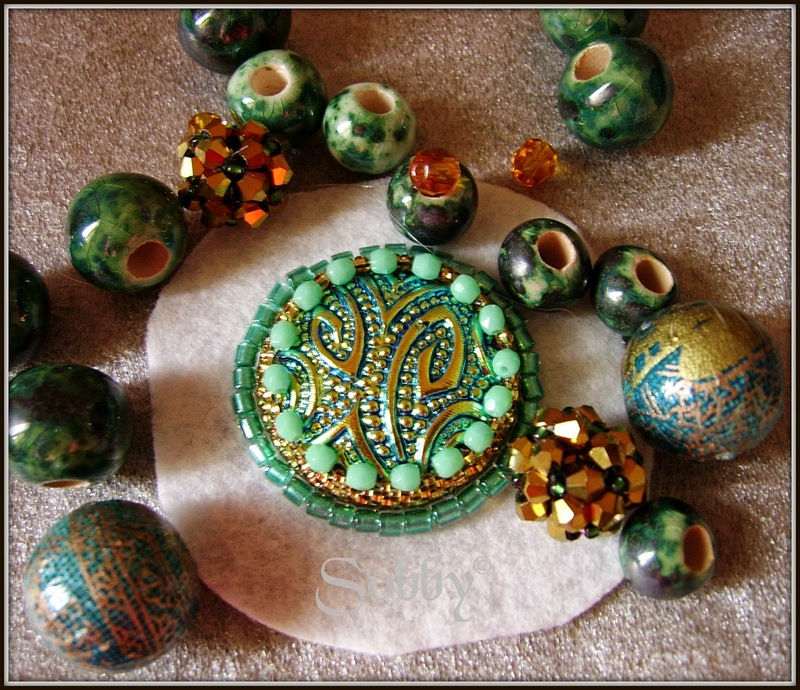 Can't wait to see what you create with those fantastic beads and the beautiful focal piece in that last photo. Thanks, I have so much soup left and still so many designs in my mind!!! Silvia, your work is exceptional but it didn't come as a surprise to me because I'm following your blog for quite some time. I love the way you combine beadweaving and other techniques. All of your pieces are so creative and original. One day will come when your art will be appreciated. Aren't you super sweet, thanks! I loved yours as well! Silvia, you are a talented artist. I love the way you combine bead weaving with other techniques. I believe that one day will come when your great skills and boundless talent will be appreciated. NB: I'm not sure I've already posted a comment. Be free to delete one. your work in great, I love the little bird! so many stunning pieces. love them, especially the bird piece. What pretty pieces, I really like the first necklace it has a lovely message that I feel we can all relate to. Your bead weaving skills are great and I love your playful use of colour too. You have made a lovely collection of work with your soup. Thanks Genea, a really appreciated visit from a talented artist as you are! Inspired use of your bead soup goodies. Your bead-weaving skills are impressive. Especially like your first necklace with such a lovely sentiment. Beautiful! Thanks Anvil, I was blessed with a glorious soup and tried to do it justice! You are an incredible jewelry designer. I simple love the wood, green and washi necklace. Good luck with German. Oh, my. What a treat. You received some beautiful soup and what you did with it is amazing. You and your muse are certainly a great pair. Love the message in the first necklace and the wood pendant of the second one is perfect for that piece. Great job! Thank you, I'll tell that to my Muse :D she is concentrated on German and definitely needs some pushing lately! For someone who is not finished, you sure did a lot!! LOL My favorite is the second piece, but I love them all. I am fascinated by the yellow piece, with seed beads that cage the larger beads, and those cube beads next to them! You are so productive, and still manage to come up with unique and beautiful and completely DIFFERENT pieces every time. I am in awe! The first necklace, in particular I think, is so YOU to me. Love them all! I'm not normally a yellow girl, but that spectacular yellow necklace is just stunning. Those washi beads are very cool! A great collection, and more to come! Holy cow! This is such a beautiful collection of creations, your pieces are all unique, colorful and interesting. I love how you combine all sorts of techniques to make very inspirational pieces. Thank you Karin, I am trying to diversify my works and hope to make it more and more interesting in the future! Gasp! Look at your amazing beadweaving! You have made so many beautiful things it's impossible to pick a favourite. Ooh I love what you made, but that second necklace is my fave. So very pretty! What a fun soup! I love how you combined the larger beads with seed beads, especially in the first necklace. Amazing jewelry! Thanks, it is my main goal to merge beadwork with other techniques and I am working hard to reach it! WOW. You are truly THE designer. All your pieces are fantastic! All kind of green tones are near my heart, and you have here many of them. I have only recently started to love green so working with it is a novelty for me. Thanks for your kind words! Wow, what lovely creations! The colour combinations are beautiful. Wow!! I love all these pieces - you are quite talented and I love the accents of seed bead work with the stone or other materials. what made me especially happy was the piece with the sweet little purple flower!! BELLA!!! Thanks Amy, I must admit I particularly love that necklace as well for some reason! Beautiful work! 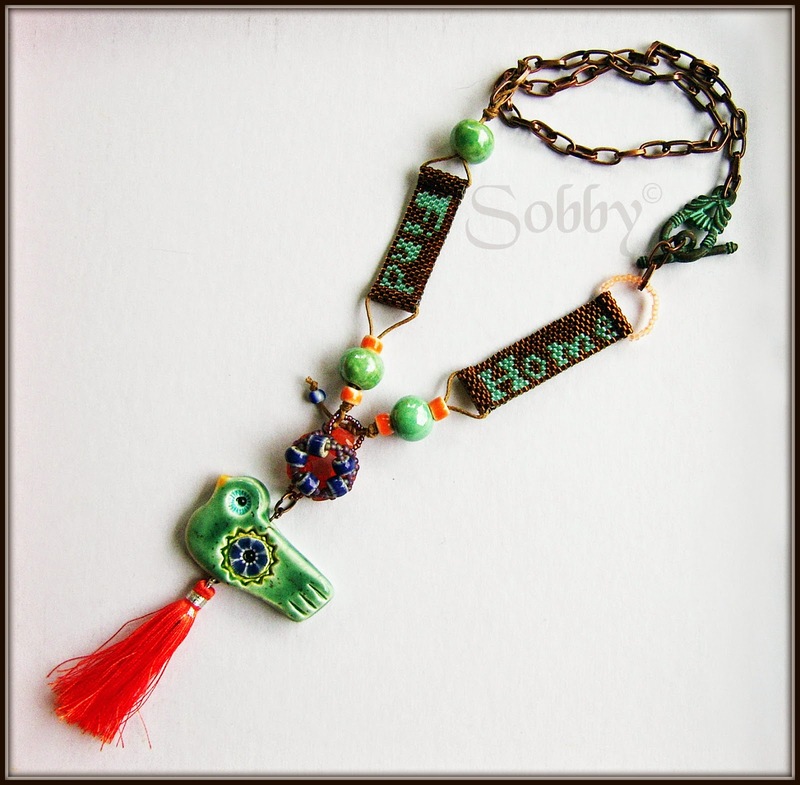 I especially love the "find home" beaded links you created for the first necklace. What a perfect fit for the little bird. Thanks Tina, I am so happy you liked it! I love the way you have used the seed beads around the larger beads in the yellow necklace. Thank you, that is indeed an amazing pattern I have followed :) it was love at first sight! I am editing in more pieces as well but I only started with one. You have a bunch already :) That bird is darling and needs almost no enhancement but you managed to enhance it anyway. The paper beads with your stash pendant are perfect as well. Great group of work! Thanks Ann, I was lucky to receive such an amazing soup! Great Work! "Find Home" is so beautiful, I love it! Nice soup! I like all that you have done and would like to see your bead embroidery piece when I is finished too. Thanks Chris, I will do my best to make something special out of it! I love your work! The bird focal necklace is beautiful! Love them all...can't wait to see what else you come up with! My goodness, Silvia, you really have a way of working with color and finding just the right beads to complement the design. I somehow missed that you'd moved to Austria, it sounds like you have your hands full. I'm amazed that you have the time to do the beadweaving. But then you're such a pro with that! I can't wait to see what you do with the final piece. It looks very intriguing. Thank you Ginger, yes it's quite challenging to do it all but I am enjoying every single minute! Lovely work, I enjoy seeing all your pieces! Thanks Janice, I wanted to convey a little bit of nostalgia - but not too much! It is a cheerful birdie after all! Thanks for stopping by! Thank you so much! Now I must fight my laziness and finish that piece...as well as many others I have in my mind! La collana con l'ucellino e' un lavoro fantastico. Fantasioso e fantastico! You are a very talented beader. Lovely work! E' tutto molto bello anche se la mia favorita è sicuramente la seconda collana ... la trovo molto fine ed elegante ... perfetto anche l'abbinamento delicato dei colori! Adesso aspetto di vedere finita la collana in embroidery!!!! Grazie cara! Devo dire che ogni volta è il secondo pezzo a riscuotere più successo :D ma anche a me piace particolarmente! You have a very creative and lovely way of merging various techniques. That is something I like to do, but I have a way to go before I reach your expertise! Very nice. La mia preferita e' la seconda collana, pero' mi piacciono tutte! E' molto bello vedere, come combini le piccole perline con perle piu' grandi. Complimenti! Grazie Alenka, è un piacere vedere che i miei sforzi sono apprezzati! Lovely pieces. Simple and elegant. Thanks for visiting me as well. Good luck learning a new language. I like the way you've mixed the seed beading in with the designs. It really adds something. Great soup and I love what you did with it. Those washi paper beads are so cool. Love your find home necklace. What a wonderfully brave an awesome adventure that you are on, finding your new home in Australia. And you're right about that wooden pendant going perfectly with with the aqua bead mix. Thanks you so much for your awesome comment! Beautiful ,Pipa my favorite was the yellow necklace I keep going back to look at it . I love the yellow necklace beautiful . Wow, your bead weaving is amazing. I love the bird necklace. Fabulous! Amazing! I love all your pieces, especially the second necklace is so beautiful. The colours and design are very harmonious. Really great done. Beautiful! I love all of your pieces, but your bird necklace especially - and your beadweaving is fantastic! Kudos! All of your pieces are gorgeous. I really like how you combine your bead weaving abilities with other elements in your design. Can't wait to see how the last piece come out. Thanks Mary, happy you liked the combo! This is SUCH a colorful post...am smiling a happy one just seeing the brilliant colors :) And I LOVE that second necklace with the wood pendant. And the yellow necklace. And washi paper beads! seriously? like the washi tape!? wowza! Yeah thos ebeads are awesome, Rosantia made them and I can't imagine the patience she had!!! That last one is going to be gorgeous when it's done, I can just tell :) Beautiful pieces, wash paper beads, wow! I think that's my favorite necklace too! I hope it will be good as well, and yeah those beads are simply awesome! 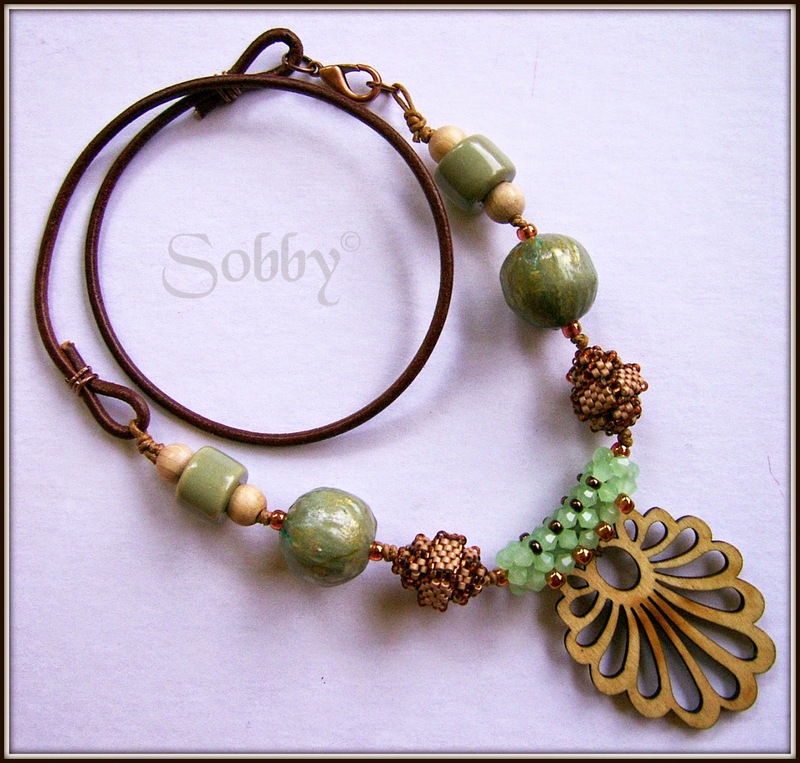 Hi PiPa, I love the second necklace, the way you have used the green beads and the wooden pendant is just lovely. Washi beads, who knew?! They look amazing and I have seen something new. Oh yeah those gorgeous beads are new for me as well! My partner Rosantia has also made an awesome tutorial for those on her blog! I love how you added seed bead weaving and beads throughout your pieces. It adds incredible detail and personality to each piece. Bravo! Thanks Kathy, beadweaving is my origin and I will always treasure it! Thanks Tari, that necklace was the result of a striking inspiration! Wonderful, wonderful pieces! I love the colors and textures. Your work is very unique and lovely! Thanks Kym, I am so pleased you took the time to stop by and comment! I can see that beadweaving can blending with non beadweaving so perfectly in your designs =) love to see them. Thanks LiliKrist, I hope to make more experiments with that in the near future! Thank you Shirley, I am also particularly in love with that necklace! I hope to finish my last pic piece soon and many more also! I thought the first necklace was going to be my favorite because it's SO great, but then I got to the second necklace with your delicate beadwork and that great, unusual focal, and it just blew me away. I really like all of your creations. Breathtaking! My jaw was on the floor with the wood piece. Oh my! Perfect piece to go with the beads! SO jealous of your incredible skills! Thanks Linda, so glad to read your lovely comment! I think the second necklace is fabulous. So very pretty. Wow, I love all the necklaces you made, they're amazingly beautiful! I really hope you find your home and feel love wherever you go! The first necklace made my smile and sigh in the same time! The second one it's breath taking, you matched them perfectly! I love the details in the green-mauve and yellow necklaces, you are so very talented! I wish you to pursue your heart! Greetings from Romania! P.S. I need to start learning German as well (I only managed a few simple words until now), my boyfriend lives in Germany for almost 3 years now and very soon I will move there as well! Good luck with learning! Thanks for stopping by Andra and thanks for your kind comment! I wish you good luck with the german,and the moving, I am sure it will be an awesome experience as it is for me now! Hi Pipa, You did a great job of showcasing the cute bird focal. The second piece is simple but very pretty. I really like your beaded beads in the third necklace. It is my favorite. Looking at what you created I bet that the unfinished piece will be great when it is done too. Thanks Becky for your detailed and so kind comment!!! Hello Pippa, thank you for visiting my blog and your lovely comment. I love the first necklace you made no wonder it is your favourite I like the use of the green tassel it goes beautifully with the bird. You made so many beauties from your soup, Silvia :) Loving everything! Such fun with the birdie pendant. That necklace is so cool! My favorite piece is the one that uses the paper beads she made for you. It has such a romantic flair. The focal you chose was perfect. Wonderful designs. The little bird looks perfectly at home on that necklace. You bead work is beautiful. The earthy yellow necklace is fabulous. 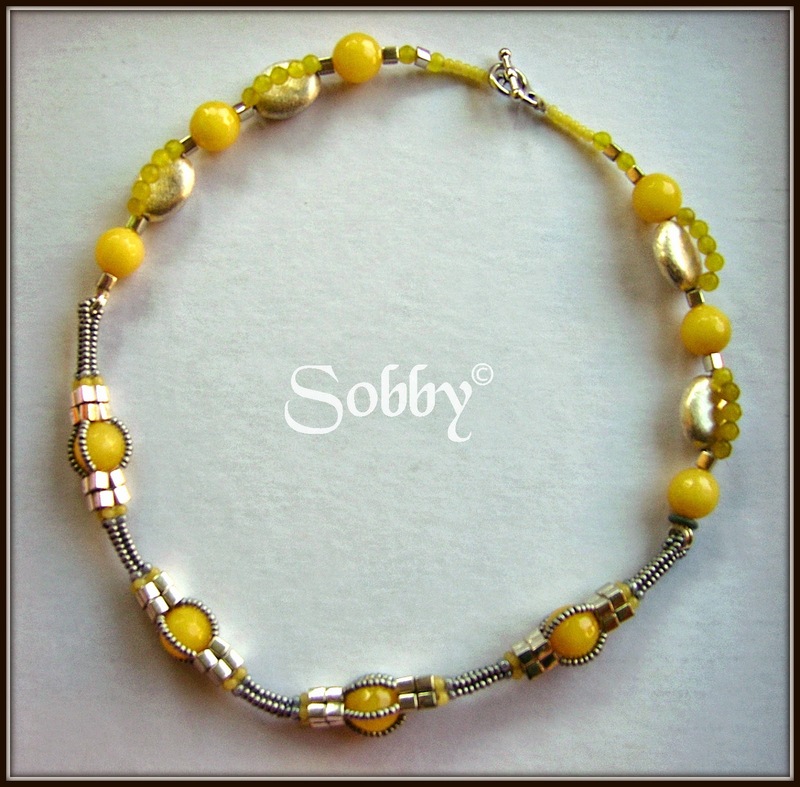 Yellow is a challenging color to work with in jewelry and you did it well. Also, I will agree learning German (or any language as an adult) is a challenge. I studied for 2 years in college and can't make a complete sentence much less have a conversation. Well done with your soup and best wishes with your studies. Beautiful pieces all of them, I love the bird necklace, also the simple wood pendant necklace. You do very skilled work with your beading! I admire you for knowing how to use all those different techniques to design your beauties! I never liked yellow, but this ♥necklace yes, I love it! Thank you so much for the nice comment on my blog! Gorgeous, absolutely love the wood green and gold necklace, so so gorgeous! Really beautiful job with your soup! That second necklace with the delicate looking focal is just dreamy. Lovey! Incredible designs, really really beautiful. I love how you incorporate different techniques. That pendant for the second piece was indeed the perfect match for the necklace! Love all the fun and beautiful pieces you created! I absolutely LOVE your "Find Home" piece...I can so relate to that. Stunning. All of your pieces came out so well. I really like the first piece. It is fun and playful with the bird focal, and meaningful with the "find home" message. Nicely done!